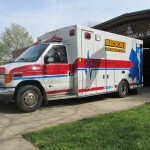 The Macochee Joint Ambulance District maintains a small fleet of three apparatus to provide emergency medical services to coverage area residents and visitors. 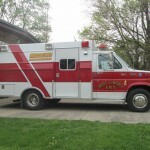 A Braun ambulance entering service in 2007, this is the primary response apparatus for the District. When staffed by a Paramedic, this unit supports full Advanced Life Support (ALS) care. A Braun ambulance entering service in 1995, this is the secondary response apparatus for the District. Squad 112 is dispatched whenever a second EMS crew is needed or when Squad 111 is unavailable. When staffed by a Paramedic, this unit supports full Advanced Life Support (ALS) care. 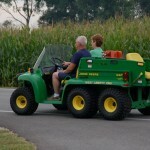 This unit is a John Deere Gator 6×6 UTV equipped with a backboard and medical supplies for patient care. Gator 111 is used to provide EMS support for community events, such as the West Liberty Labor Day Festival and West-Liberty Salem High School football games. This unit is capable of supporting Basic Life Support (BLS) care.